The Italian dressing both provides flavour and added moistness to this simple, yet versatile, meatball recipe. Mix meat, onions, bread crumbs, egg and 1/4 cup dressing just until blended; shape into 12 (2-inch) meatballs. Place on foil-covered rimmed baking sheet. Bake 20 min. or until done (160ºF). Meanwhile, cook spaghetti as directed on package, omitting salt. About 10 min. before spaghetti and meatballs are done, heat pasta sauce in saucepan on medium heat. Drain spaghetti; place in serving dish. Top with pasta sauce. Drizzle remaining dressing over meatballs; serve with spaghetti. Use moistened hands to easily shape the meat mixture into meatballs. Sprinkle 2 Tbsp. 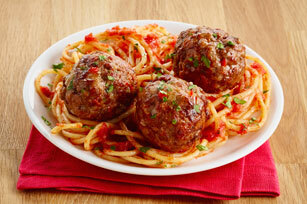 Kraft 100% Parmesan Grated Cheese evenly over the spaghetti and meatballs.